The pathway to reform is the combined work of governments, international organisations and business leaders. Their contributions come together to form the Communiqué Annex. If you wish to make a contribution to the Annex, please contact us. Fossil Fuel Subsidy Reform (FFSR) – A global response. 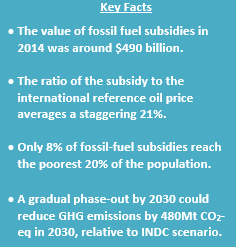 The IEA estimates the value of global subsidies to fossil fuels to be around $490 billion in 2014[i], with oil subsidies accounting for more than half of the total. This translates into, on average, a subsidy rate of 21%, meaning that consumers paid roughly only 79% of international market prices for fossil fuel products. The main objective of fossil fuel subsidies is usually to hold down the cost of energy for poor households or to redistribute national resource wealth. In practice, however, IEA analysis indicates, that only 8% of the money spent on fossil-fuel subsidies reaches the poorest 20% of the population[ii]. The impact of this inefficiency is compounded by the fact that the fiscal burden of inefficient fossil fuel subsidies weighs heavily on some precariously placed economies, and in some developing countries squeezes the resources available for education and health. Reforms to fossil fuel subsidies also have the potential to make a significant contribution to the reduction of green-house gas (GHG) emissions. IEA analysis shows that a gradual phase-out by 2030 could reduce GHG emissions by 480Mt CO2-eq in 2030 relative to INDC scenario where the impact of intended nationally determined contributions submitted by countries is assessed. Furthermore, fossil fuel subsidies incentivise wasteful use of energy, hinder investments in low-carbon technologies, energy-efficient equipment and decreases responsiveness of demand to price. Fossil-fuel subsidies can cause financial losses to energy suppliers as a consequence of under-pricing of energy commodities that could result in under-investment in energy supply. Therefore, reforms to phase out fossil fuel subsidies will provide greater scope to attract investment for energy infrastructure, as well as provide consumers with incentives to save energy and aid the commercialization of renewable energy and other clean technologies. Importantly, we are seeing global leadership on the need to reform fossil fuel subsidies. In 2009 G20 leaders pledged to “rationalize and phase out inefficient fossil fuel subsidies that encourage wasteful consumption over the medium term”. Fossil fuel subsidy reform (FFSR) also featured in the Third Financing for Development agreement earlier this year in Addis Ababa. This global deal, involving both developing and developed countries – such as the G77 group- included another global agreement to reform inefficient fossil fuel subsidies. This was followed by the inclusion of FFSR as part of the Sustainable Development Goals adopted by the UN General Assembly in September. Various other international efforts, both on a multilateral and bilateral basis, have been made to drive the reform of fossil fuel subsidies. Alongside the IEA, which publishes analysis on FFSR in their World Energy Outlook every year, other international institutions have also undertaken analysis supporting FFSR. The UK, along with other pro-reform countries, has looked to support energy pricing and subsidy reforms in countries across the world through its bilateral assistance. Other global initiatives such as Friends of Fossil Fuel Subsidy Reform have also played a significant role to build up the momentum for reform. Figure 1 illustrates that globally, fossil fuel subsidies fell slightly in 2013 and 2014, after experiencing continuous increases from 2009, in line with international energy prices but also as a result of policy reforms in a number of countries, which offset higher consumption of subsidised fuels. The IEA’s latest analysis reveals that while movements in world prices typically have the greatest impact on the total cost of fossil fuel subsidies from year-to-year, policy interventions have played an important role over time. In the absence of reforms that have been taken place since 2009, the value of global fossil fuel subsidies would have been $117 billion, or 24%, higher in 2014 at $610 billion, as illustrated in Figure 2. 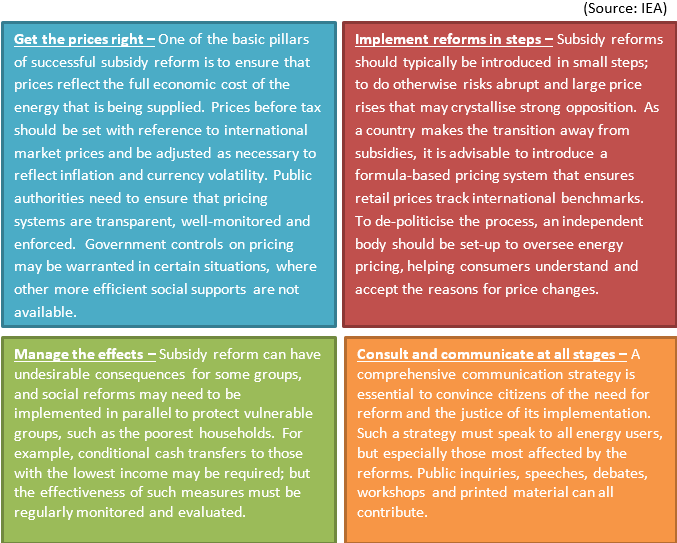 Table 1 summarizes the recent development on subsidy reforms in selected countries. Despite their economic, social and environmental costs, fossil fuels subsidies are stubbornly persistent and governments face difficult challenges in reforming them. For this reason the UK, along with others, have continued to call for further international cooperation to better understand FFSR issues, share best practices and effect more urgent action to realise the many benefits that fossil fuel subsidy could bring. The plunge in oil prices since mid-2014 could add further momentum to the phase-out of consumer fossil fuel subsidies, by reducing the gap between market and subsidised prices and so making withdrawal of subsidies less politically controversial. Indeed several countries, including India, Indonesia and Malaysia, have already seized the opportunity. It has also put direct pressure on government budgets of major oil and gas exporting countries, and exporters like Angola have made reforms. However, it should be acknowledged that by reducing the cost of subsidising energy consumption, lower international prices could also reduce the budgetary urgency for oil and gas importing countries to take action. Efforts to encourage reforms need to continue even through periods favourable for reform. Phasing-out fossil-fuel subsidies represents a triple-win situation. It would enhance energy security, reduce emissions of greenhouse gases and bring improved fiscal space for governments. This should provide nations an incentive to make subsidy reform a key policy within wider and more comprehensive strategies to achieve sustainable development and to combat climate change. Strong progress has been made, but much still remains to be done and further global action towards successful implementation of the reforms is needed. 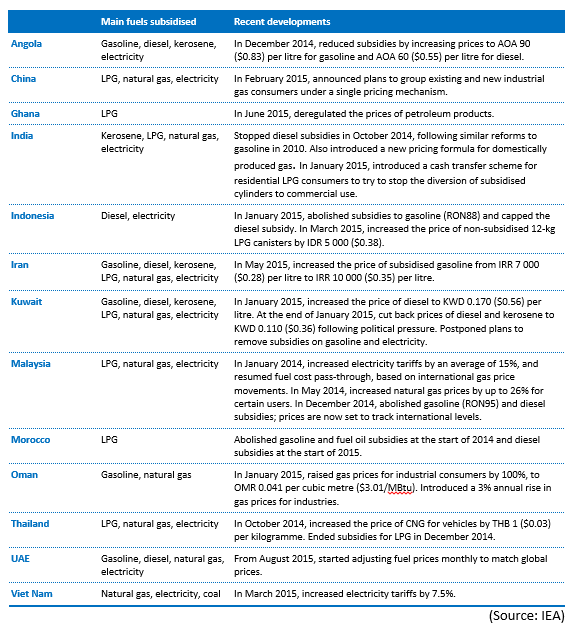 [i] World Energy Outlook (IEA, 2015). The IEA estimates cover subsidies to fossil fuels consumed by end-users (households, industries and businesses) and subsidies to the consumption of electricity generated by fossil fuels. Chile joins the efforts of the Friends of Fossil Fuel Subsidy Reform convinced of the need to rationalize or eliminate inefficient subsidies for the use of such fuels, that imply a significant setback in combating climate change by artificially altering their price and incrementing their consumption. Currently there is a massive use of unjustified fossil fuel subsidies in the world, and Chile welcomes efforts to eliminate or rationalize inefficient subsidies by raising awareness of their negative impacts. For these reasons Chile is glad to join the communiqué as a non-binding instrument. The communiqué doesn’t preempt any country to adopt or maintain, within its national capacity, measures that it considers to be efficient and responsive to social needs, such as the provision of basic energy services to vulnerable populations; to avoid extreme volatility in the international fuel prices, that entails grave effects at a national level; or to transitionally encourage the progressive replacement of one type of fuel by another that is cleaner, in order to progressively transit to a low-carbon economy. Additionally, by joining the communique, Chile is not endorsing any particular view in relation to implicit fuel subsidies. Chile wants to contribute to a cleaner world and is pursuing bold initiatives to encourage renewable energy. This is also accompanied by the introduction of an emissions tax, which is an important step towards a legal framework that aims at the internalization of the external costs of the use of fossil fuels, including carbon emissions as well as locally relevant emissions. From this perspective, the elimination or rationalization of inefficient fossil fuel subsidies is a much needed step at a global scale in order to create a level field that allows a transparent carbon pricing, to establish the real costs associated with the intense use of fossil fuels and a necessary step to combat climate change. Pacific Small Island States represent the most vulnerable countries in the world and are at the frontline to the impacts of climate change. We are deeply concerned that the future of our nations is threatened by climate change and we call upon the international community to respond with a concerted and ambitious approach to address the greatest threat to humanity. The world must rapidly transform its use of energy from fossil fuels to low carbon development including renewable energy and other technologies to move to zero emissions. The Cook Islands is committed to a clean green future powered by renewable energy as articulated in the National Sustainable Development Plan, National Climate and Disaster Compatible Development Policy and the Cook Islands Renewable Energy Chart. We support and endorse the valuable goals set out in this Communique also emphasising that a temperature rise of above 1.5oC will severely exacerbate the particular challenges facing the most vulnerable small island states of the Pacific. The Cook Islands is committed to a sustainable and resilient future. We call on others to follow and leave no one behind. Denmark is a founding member of the “Friends of Fossil Fuel Subsidy Reform” and a prominent advocate for building international support around the issue. Denmark is also supporting concrete reform efforts in developing countries around the world via support to the IEA, WB-ESMAP and the IISD-GSI. Protection of the environment is important to the citizens and is viewed as a precondition for prosperity and a good life. The German target of reducing CO2-emissions by 40% until 2020 and by 80-95% until 2050 compared to 1990 requires the transformation of our energy system as well as efforts in all relevant sectors. With the so-called Energiewende, Germany moves away from fossil fuels and transitions towards renewable energy and energy efficiency. It is a central building block of German climate policy. Distortions to the detriment of sustainable energy and climate technologies must be avoided. With the climate action programme 2020, the government agreed to review existing subsidies and look into their environmental sustainability, including a review of whether existing subsidies have a climate-damaging effect. Germany also engages at European and international level for the phasing-out of climate-damaging subsidies, for example, the ESMAP’s Energy Subsidies Reform Facility is supported with funds from the German government. Furthermore, Germany and the other G20 member states agreed to commit themselves at the G20 Summit in Pittsburg 2009 and 2013 in Saint Petersburg to phase-out inefficient subsidies on fossil fuels over the medium term. New Zealand is a founding member of the ‘Friends of Fossil Fuel Subsidy Reform’, leading efforts to encourage countries to reform. Transparency is an essential first step and that’s why in 2015 New Zealand was one of the first economies to undertake the APEC peer review of our policies. This provided a useful ‘health check’ and the international review panel did not identify any inefficient subsidies that encourage wasteful consumption. New Zealand eliminated consumption subsidies for CNG and LPG in the 1980s. Sweden is one of the members of the Friends of Fossil Fuel Subsidy Reform. In combating climate change Sweden emphasizes the importance of making polluters pay, by putting a price on carbon emissions. Already in 1991 a carbon tax was introduced in Sweden as a complement to the existing system of energy taxes. Today the general carbon tax level is approximately $ 150 per ton of carbon. Sweden is considered a green pioneer, aiming for a completely fossil free society (www.government.se/fossilfreesweden). The governments’ long-term ambition is that the energy system should be based on 100% renewable energy. Besides participating in the Friends activities, Sweden has since 2011 been supporting Global Subsidies Initiative (GSI) and their work to support government efforts to reduce fossil-fuel subsidies, for instance by helping building capacity, raising awareness of, and facilitating an informed national dialogue on reform options. Switzerland is a member of the group “Friends of Fossil Fuel Subsidy Reform” since its foundation in 2010. By encouraging wasteful consumption, impeding innovation in renewable energy, and depressing investment in energy efficiency, fossil fuel subsidies are slowing down and further delaying the necessary and ultimately unavoidable shift to sustainable economies. Removing inefficient fossil fuel subsidies would free up important public resources that could be better allocated – in particular for the implementation of the 2030 Agenda for Sustainable Development. It would furthermore contribute substantially to climate change mitigation. Federal Councilor Doris Leuthard says: “Fossil fuel subsidy reform offers a path towards a sustainable future. The challenge we face is about figuring out how to replace the 20th century model of fossil-fuel based economic growth. The 21st century model requires a transition to a low-carbon economy allowing for sustainable growth and prosperity. The currently low oil prices provide a rare opportunity to accelerate the transition to clean, efficient and renewable forms of energy”. Renewable energy and energy efficiency are the main pillars of the Swiss energy strategy for 2050. Switzerland also actively promotes the removal of fossil fuel subsidies and supports developing countries and transitional economies in related efforts, notably by supporting sustainable infrastructure projects in the energy sector. The United States endorsed the ‘Friends of Fossil Fuel Subsidy Reform’ communiqué in the spring of 2015. The United States strongly supports and has played a key role in fossil fuel subsidy reform efforts through domestic and international action. At home, the United States Treasury Department estimates that U.S. federal fossil fuel subsidies to producers of oil, natural gas, coal, and other fossil fuels total nearly $4.8 billion per year. The President is committed to eliminating these subsidies and has advocated for their elimination in his budget. Abroad, the United States continues to work with the G-20 and APEC to build consensus around phasing out economically inefficient fossil fuel subsidies by a date certain. To achieve this goal, the United States participates in and encourages all member countries to participate in fossil fuel subsidy peer reviews in the G-20 and APEC. Specifically, the United States and China are currently undergoing a peer review in partnership with Germany, Indonesia, and Mexico through the G-20. Comme l’a souligné le ministre Michel Sapin en ouverture du Climate Finance Day en mai à Paris : «Nous savons tous que le carbone a un coût : ce coût est environnemental et social. C’est pourquoi le carbone doit avoir un juste prix. » La conclusion de l’accord sera le signal politique que tous les pays attachent implicitement un prix au carbone. La France soutient les « amis de la réforme des subventions aux énergies fossiles ». Ces subventions sont néfastes écologiquement et ne sont pas efficaces socialement. Pour engager au plus vite la transition vers des économies résilience et sobres en carbone, leur suppression est une nécessité. S’il est crucial de ne pas subventionner le prix des combustibles, ces derniers doivent aussi progressivement refléter les coûts qu’ils induisent sur l’environnement. La France dispose depuis 2014 d’une taxe carbone, dont le taux, de 14,5 €/tCO2 en 2015, croit progressivement, avec pour objectifs d’atteindre 56€/tCO2 en 2020 et 100€/tCO2 en 2030. More than 40 years ago, Comvita was founded by two beekeepers who set out to connect people to nature for the benefits of good health. That vision continues today, and as a company that works so closely with nature – sourcing her ingredients – we try hard to look after the environment we operate in. Comvita is supporting the Fossil Fuel Subsidy Reform because we understand the importance of sustainability in business and believe all companies, big or small, should work in harmony with nature. Green Budget Europ aims to promote a transformation of Europe’s budgets and tax systems to ensure that Europe in the 21st century is environmentally, economically and socially sustainable. We achieve our goals through knowledge-exchange and information-sharing and a combination of research and advocacy work at EU level and within EU Member States. After more than 30 years of environmental taxation in Europe and as many years of research into subsidies and their reform, it is clear that there are better ways to address competitiveness concerns than undifferentiated subsidies. Spending that is diverted from other areas, such as health, education or welfare, and which creates unnecessarily high levels of national debt and contributes to structural deficits. Mainstreaming fossil fuel subsidies reform to increase its political feasibility is therefore at the heard of our work. Furthermore, GBE regularly collaborates with organisations focussed on fossil fuel subsidy reform in international policy debates, e.g. the Green Growth Knowledge Platform, IISD’s Global Subsidies Initiative, Oil Change International. IRADe is a fully autonomous advanced research institute, conducting research studies highlighting the importance of fossil-fuel subsidy reform and more importantly rationalization of subsidies to mitigate impacts on vulnerable groups of society when implementing reforms. Fossil fuels are important for many economic activities, whereas universal subsidies generate inefficiencies in the energy market, which disincentives innovation and promote distorted consumption. Fossil-fuel subsidy reform would create a win-win scenario for all the stakeholders as it has clear economic, social and environmental benefits. Reforming fossil fuel subsidies would be good for energy security as it will pave the way for the transition from finite (fossil fuel) to infinite energy (renewable) sources by removing price distortion and making them equally competitive. Therefore, we need to take a long-term view of the cost and benefits of the use of fossil fuels, given the current climate change situation; we need to make greener technologies competitive. “Countries need to demonstrate with concrete actions and policies that they are serious about combating climate change. Reforming harmful fossil-fuel support is a good place to start,” said OECD Secretary-General Angel Gurría in adding his organisation’s endorsement of the Fossil-Fuel Subsidy Reform Communiqué. The OECD contributes to improving transparency on government support to fossil fuels through its online Inventory of Support Measures for Fossil Fuels. This Inventory documents some 800 individual policies that support fossil fuels in the OECD region, as well as in Brazil, China, India, Indonesia, the Russian Federation, and South Africa. The OECD Companion to the Inventory of Support Measures for Fossil Fuels 2015 explains recent trends in these policies, and Taxing Energy Use 2015 provides further details on the structure and level of energy taxes in OECD and a selection of other countries. The OECD’s Environmental Performance Reviews and Economic Surveys routinely discuss policies that favour fossil fuels and offer advice on how to change them. The OECD has actively supported the G20 agenda by co-authoring several reports on fossil-fuel subsidies for the group. It has also lent its expertise to the APEC and G20 peer reviews of inefficient fossil fuel subsidies that contribute to wasteful consumption. The OECD looks forward to continuing to work closely with the Friends of Fossil Fuel Subsidy Reform. 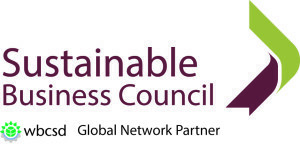 The Sustainable Business Council supports reform of fossil-fuel subsidies. New Zealand businesses have a strategic interest in mitigating climate change and making sure businesses and communities are resilient. Ensuring the true cost of fossil fuels – economic, environmental and social – are visible to the market will assist the transition to a low-carbon economy. New Zealand businesses are seeking ways to support research and development and accelerate the introduction of new, low-emission technologies. The removal of fossil fuel subsidies globally will give businesses certainty and create the conditions needed to accelerate the uptake of renewable energy and incentivise the shift to greater energy efficiency. Any changes to fossil fuel subsidies should be introduced in a measured and consistent way so that businesses can plan and adapt accordingly. As countries and other industries move to put a price on carbon, international aviation and shipping remain protective of the tax-free status for their fuel. In the post-war period fuel for international aviation was granted tax-free status through a series of legal agreements while fuel for shipping has always been tax free. Whatever merit these special privileges may have had in the 20th century, they are totally out of date in the 21st where ending our reliance on fossil fuel is our shared responsibility. Both industries have highly effective lobbying operations which are working to uphold the status quo. However these sectors are significant drivers of global warming and their emissions are projected to grow up to 250% by 2050. Governments must take decisive action to end these tax arrangements, and by doing so, can drive efficiencies in the sector while also raising much needed revenue for climate finance. Even from the very beginning, we always knew that we were going to take the road less travelled. To think differently and stand out from the crowd. 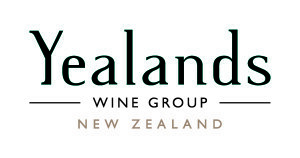 On 08.08.08, when Peter Yealands shared his vision of becoming the world’s most sustainable wine producer, he already knew that the only way to craft truly beautiful, award-winning wine was in partnership with Nature. And, that compromising his deeply-rooted sustainability values was simply not an option. Caring for the environment comes in many forms. Cutting-back on the harmful greenhouse gases caused by carbon emissions, looking after the resources that we already have and constantly finding innovative ways to generate renewable energy. In fact, leaving no stone unturned. So, whether it’s building the first winery in the world to be certified as carboNZeroCertTM from inception, engineering New Zealand’s only vine pruning burners as a major energy source or installing one of the country’s largest array of solar panels, we’re determined to tackle the really big issues head-on. Every day we’re growing closer to our goal of becoming energy self-sufficient and carbon negative. We believe this is the only way to work in harmony with nature and for this reason we support this reform.